Tricksie is the pride of Ambler Keenan Mitchell Johnson. 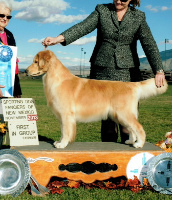 She travels the United States sharing her beauty with the world, while bringing home awards such as the Sporting Dog Fanciers of New Mexico Best in Show. Tricksie is a close friend of Morgan, our pet trust consultant. They often get together to play ball and conspire against cats.